iSquared Communications has fifteen consecutive years experience in developing and implementing strategically driven, integrated public relations, advertising and marketing services for both private and public sector entities. Within five years of start-up, we grew to become the 25th largest agency in metro Atlanta. According to the rankings published by the Atlanta Business Chronicle, iSquared Communications is Atlanta’s 12th largest privately owned, full-service marketing communications company. Georgia Trend called us “a major player” and a James Magazine survey of similar companies ranked us the 5th most effective in the state. Refer to the chart that shows the growth history of the firm over the past two and half years. 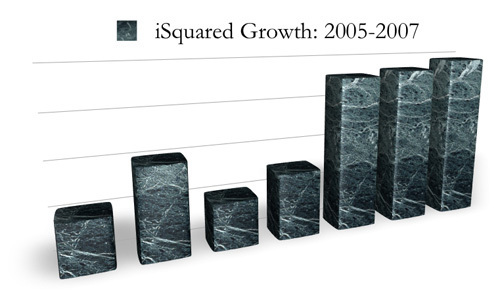 We had our best year ever in 2007 and are well on the way to equaling or exceeding that growth this year.